Oral health affects how the whole body feels, so we emphasize preventive dental care, including regular oral diagnostic and treatment procedures on an as-needed, individual basis, along with home care such as brushing, dental sprays, chewing exercises, and special tartar control treats and foods (such as Science Diet Oral Care or Prescription Diet TD). 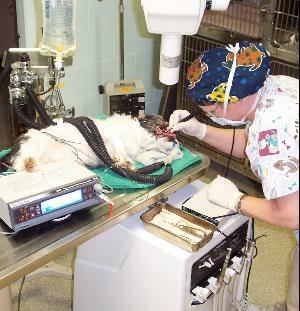 Anesthesia with its associated monitoring is a must for veterinary dentistry. More extensive dental care for those with periodontal disease is available; for example, placing a product called perioceutic can help. Special dental Xrays are routinely recommended, just as your dentist needs Xrays to see what is happening to the roots of the teeth, allowing us to diagnose problems not visible above the gumline. We use state-of-the art digital Xray equipment so that we get the pictures within seconds of the xray. Digital xrays allow for less radiation exposure (which is safer for the pet and the technician!) and more detail being visible on the xray which allows for better interpretation and health care. The time savings reduces anesthetic time for your pet and lowers its expense for you. Of course, neglected teeth often progress to the point of needing extraction so we want to prevent that, but when it's necessary, you can be sure your pet will receive adequate pain control. Realize that it is imperative to removed decayed or severely disease teeth since they are a source of chronic pain to the pet, the periodontal disease spreads to neighboring teeth, and the associated infection can spread into the bloodstream, leading to heart, kidney, and lung disease. For animals with chronic periodontal disease, use of antibiotics on a monthly basis, called pulse therapy, has been shown to be beneficial in slowing the progression. An Oral Diagnostic and Treatment Procedure is much more involved than most people realize. First, a pre-anesthetic exam is done of the entire pet as well as the mouth. Our ability to do an oral exam is limited on an awake animal, though, so often we really don't know the extent of disease until another exam is performed under anesthesia. The teeth will be both manually and ultrasonically scaled above and, most importantly, below the gumline. Each tooth, and the rest of the mouth, is examined for mobility, wear, fractures, and decay and all sides of each tooth is probed for pockets underneath the gumline; these results are all charted individually. Dental xrays are taken to assess for deeper disease. The teeth are polished, rinsed, and then fluoride is applied to help strengthen the teeth and to combat infections. Further therapy is performed as is warranted based on individual tooth requirements. Finally, the teeth are dried and a barrier sealant called Oravet is applied to help slow the re-attachment of plaque. The animal is then woken up and sent home a few hours after the procedure. The cleaning process in a medium sized dog that needs no special treatment takes approximately 30-40 minutes. We will provide a complementary progress exam 2 weeks later to be sure that any areas of therapy have healed satisfactorily and review the necessary home care to slow the recurrence of tartar buildup. This includes using CET chews (rawhides that are coated with a bacterial fighting enzyme) or other products such as nylon bones or rawhide products, daily tooth brushing, tartar control diets, and most importantly, weekly re-application of the Oravet Barrier Sealant. You will receive an 8 week (or longer) supply of this when your pet goes home from his dental cleaning. Don't forget that your pet can receive all aspects of a routine cleaning described above if you enroll in our Preventive Health Care Plan for Adult Dogs or Cats: Basic Care with Oral Diagnostic and Treatment Procedure. Full mouth xrays are included. You also receive a discount on any other dental products or treatments needed such as surgery, extractions or medications. Call for more information since these plans are currently being revised.